For the pickling liquid, combine all the ingredients with 1 cup of water and bring to a boil. Reduce the heat and simmer for 20 minutes. Makes about 3 cups. Cut the peeled salt-baked carrots into 1 1/2-inch pieces and place in a ceramic bowl. 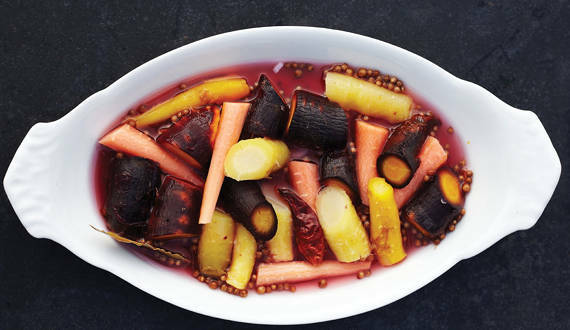 In a large saucepan, bring the pickling liquid to a boil, then pour over the carrots. Cover and set aside in the refrigerator to cool. The carrots can be served right away; however, I like to let them macerate for at least 45 minutes in the refrigerator. In Recipes-list.com we have selected the most viewed recipes from category - uncategorized . Enjoy the best recipes specially selected for you! Pickled Carrots is the right choice that will satisfy all your claims.